Week 1 of the Alliance of American Football’s first season is in the books, as are our grades for every player on every play of every game. Mirroring our Team of the Week from the NFL side of things, this season we’ll award players to our team of the week in an attempt to shed light on the top performances from the previous weekend’s slate of action. 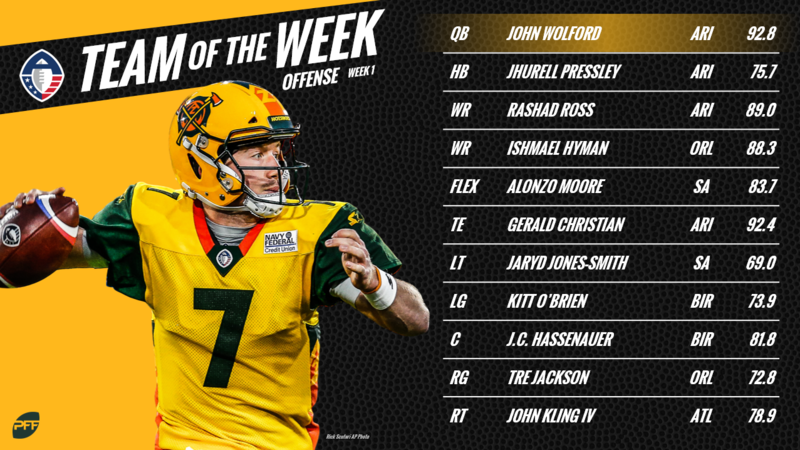 Wolford lit up the field for the Hotshots in an impressive debut even if fans were expecting to see Trevor Knight at quarterback. He threw a league-high four big-time throws and limited the mistakes with zero turnover-worthy passes. His 9.5 yards per attempt led the AAF as well, as did his 275 passing yards, four touchdowns and 84.0% adjusted completion percentage. An all-around strong first performance for the former Wake Forest standout. Trent Richardson may have hit paydirt twice but Pressley was more dominant in all aspects of the game on Sunday. He ran the ball 18 times for 64 yards, having to earn 61 of those yards after contact. He forced four missed tackles and averaged 3.6 yards per attempt. He rounded out his afternoon by hauling in a deep pass touchdown from Wolford to cap the strong debut. Ross is just another on the list from the Hotshots as he led the league with two touchdown receptions and an additional three first-down catches. He was one of just two receivers to go over 100 yards in the air as he also made contested catches seemingly his job. He was targeted three times on contested situations and hauled in two of those receptions, as no other receiver had more than one. Hyman racked up the yards in what seems to be a short-area passing attack for the Apollos, totaling 34 yards after the catch, running for 19 of those after first contact with a defender. Hyman’s two receptions went for first downs as each of his catches were chalked up as an explosive play. Look for him to be featured more in the Orlando offense depending on the severity of Marvin Bracy-Williams’ injury. Moore turned three receptions into 78 yards, all three of which converted first downs. He was not necessarily a threat after the catch but he did convert his lone contested target into a reception. Christian wasn’t utilized much early but did haul in a touchdown reception and two more first-down receptions on his three catches, reaching 44 yards in the process. He was a plus-blocker in run blocking and in pass protection, giving him an impressive 92.4 overall grade, the top grade this weekend. Jones-Smith did his best work in pass protection, not allowing a single pressure on 21 pass-blocking reps.
O’Brien held his own in pass protection, allowing just a single hurry on 40 snaps in pass protection while he also finished with the second-highest run-blocking grade among guards in Week 1. Hassenauer ranked first among centers with his dominant run-blocking performance and was no slouch in pass protection either, not allowing any pressures in 40 snaps. Jackson’s pass-blocking grade was the second-highest among any offensive line position this weekend as he ranked first among guards, not allowing a single QB pressure on 35 snaps in pass protection. Kling IV was the only tackle this weekend to rank in the top five in terms of both run-blocking and pass-blocking grade as he allowed just one hurry on 44 pass-blocking snaps against Orlando. Perhaps the most famous player from the early slate of games, Washington absolutely crushed San Diego QB Mike Bercovici on a hit as that was just a small sample of his dominance on the edge for the Commanders. He racked up four pressures on just 17 pass-rushes with two sacks and a forced fumble on the hit on Bercovici. 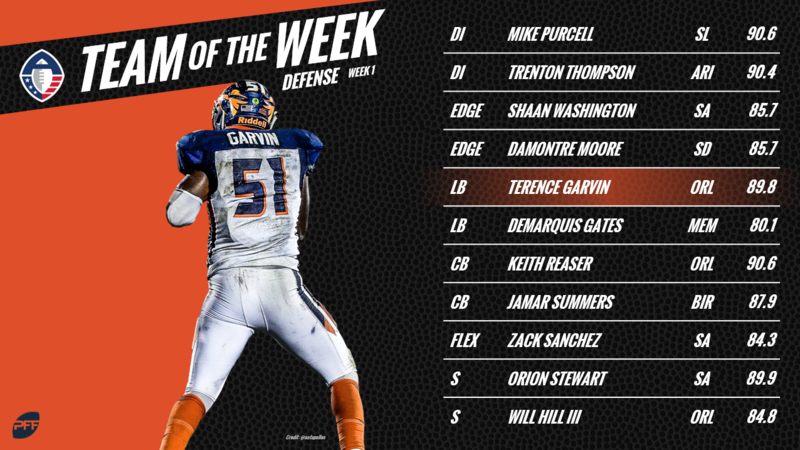 Purcell brought pressure up the middle but it was his run defense that lands him on the team of the week despite Salt Lake allowing 38 points. He batted a pass, accumulated four pressures and made a stop in run defense to round out his evening. A former college standout in terms of PFF grades, Thompson brought the same kind of force we were used to seeing from his days at Georgia in his first game with the Hotshots. He recorded two pressures on just 15 pass-rushes while he also made four total tackles without a single miss. Moore led all defenders with a whopping nine total pressures as he carried over his expertise from his NFL playing days. He rushed the passer on 30 snaps to accumulate the league’s second-highest pass-rush grade at the position in the process. Not much more can be said about a two-interception performance, especially when you capitalize on one of those picks with a touchdown return in the process. Garvin 90.1 coverage grade was by far the best among linebackers as it ranked third among all defensive players from Week 1. Based upon his large amount of snaps played for the Express, Gates gets in here after leading the league in tackles with 12 total (10 solo, 2 assists). He flew around the field and even saw six targeted passes come his way, allowing just four receptions for a mere 24 yards. His two forced fumbles kept Memphis in the game early. Reaser absolutely shut down receivers in his coverage on Saturday night, allowing just two receptions on five targets (40.0% completion percentage) and all of 14 yards. He broke up two balls and saw just a 47.9 passer rating when targeted. Summers was also dominant in pass coverage, allowing one lone reception on three targets, but limiting that reception to negative yardage. His interception was a highlight and quarterbacks saw just a 2.8 passer rating when throwing his way. Sanchez made the splash play of the weekend, making an acrobatic interception against San Diego as he limited receivers to just four receptions and just 20 yards on his six targets. He allowed a passer rating of just 31.9 on throws into his primary coverage. Targeted just once as the primary coverage defender, Stewart made an interception while he also flew all over the field for the Commanders. He racked up five total tackles and two defensive stops and an additional pass breakup. Hill was a force on the back end for the Apollos, making a pass breakup in coverage and limiting another reception on a throw his way to just seven yards. He made seven total tackles and did not miss a single attempt in Orlando’s season-opening victory.